A brilliant value pack from a timeless, much-loved series. Come to Heartland – a farm like no other, a sanctuary where sick horses are healed. Growing up, Amy Fleming watched her mother instil trust and hope in horses that were once fierce and afraid. Amy has inherited her mother’s gift, the ability to listen to horses and understand what they need. But on the day that a terrible accident changes everything, Amy is left with nothing but her mother’s words – and Heartland. This classic series is the perfect choice for anyone who loves horses. If that’s you, visit Heartland today! I really want this set!!! I’m reading the heartland books now but I only have the first 2!!! They are sooo good! 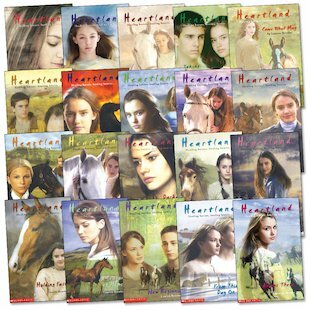 I actually am currently reading one of Heartland and it is brilliant! I think Amy is having a rough time during the book I am reading but I like it that way with all the adventure. I like Melody the horse who is about to have a pony but after the nasty fall they are not so sure.